1. Milwaukee -- Sales of existing homes rose 21% in August in the metro Milwaukee area, extending a string of 14 year-over-year monthly increases that is reducing the inventory of homes on the market. Through the first eight months of 2012, sales were up 27.7%. 2. Baltimore -- Home sales were the highest for the month of August since 2007, with a 17.5% year-over-year increase. Pending sales in August were up 18% versus last year and the average home price increased 3%. 3. Memphis -- Home sales in August were up 21% year over year, representing the eighth consecutive monthly increase from 2011. Inventory is down, days on the market are down, and agents are cautiously optimistic for growth. 4. Birmingham -- August home sales increased 18.4% vs. last year, average price was up 13% and median price by 3%. 5. Nashville -- Home sales increased by 27.3% in August compared to a year ago, and the median price increased by 1.8%. 6. Iowa -- Home sales pushed 15.5% higher to 3,602 in August over a year ago, and the median sale prices climbed 3.8 percent. 7. 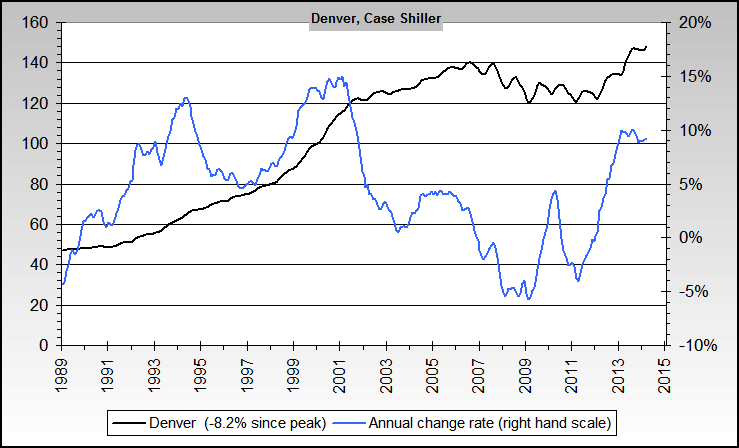 Denver - August home sales increased 18% above last year, and average prices were up by 10%. 8. North Texas (29 county region) -- Sales of existing homes in North Texas in August were up 18% from a year ago, marking the 12th consecutive month of gains, and eight straight of double-digit increases. The median sales price rose 8 percent to $164,000. Nothing's wreaked quite the havoc on the U.S. economy, and indeed the national psyche, as the six-year slide in home prices. It wiped out some $7 trillion in household wealth, savaged bank balance sheets, and induced the Great Recession and the tepid recovery. Yet there are unimpeachable signs that this national nightmare is now over. Home prices are starting to rise, if somewhat haltingly, in most areas of the country. And a number of forecasters predict home-price increases around 10% or so nationally over the next three years, with some metropolitan statistical areas, such as Midland, Texas, and Bismarck, N.D., likely riding the energy-exploration boom to better than 20% jumps in residential-real-estate prices. Yet there are unimpeachable signs that this national nightmare is now over. Home prices are starting to rise, if somewhat haltingly, in most areas of the country. And a number of forecasters predict home-price increases around 10% or so nationally over the next three years, with some metropolitan statistical areas, such as Midland, Texas, and Bismarck, N.D., likely riding the energy-exploration boom to better than 20% jumps in residential-real-estate prices. wreaked quite the havoc on the U.S. economy, and indeed the national psyche, as the six-year slide in home prices. It wiped out some $7 trillion in household wealth, savaged bank balance sheets, and induced the Great Recession and the tepid recovery. 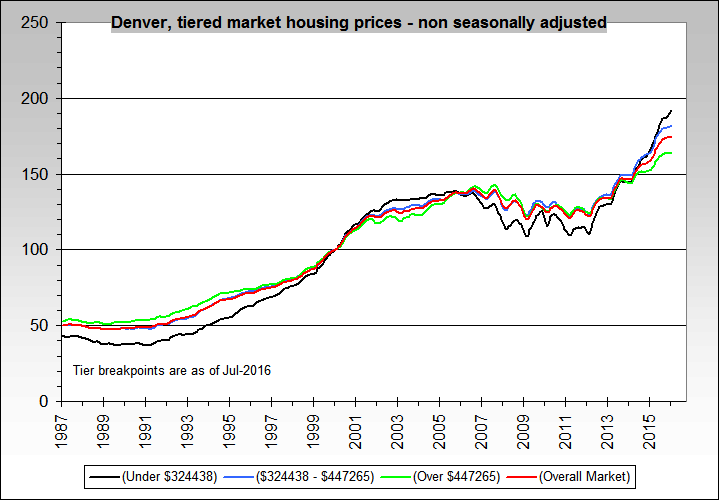 Denver August... "average prices were up by 10%." That's not mile high but rather a sky high increase. be careful with locally reported price moves. they tend to be more affected by mix than actual prices. the best home price indexes (like case shiller) go to great lengths to compare like to like and houses against themselves to get accurate comparisons. many local reports just divide the aggregate sale prices by the number of homes sold and so one big high priced property can move the needle and a mix shift toward more upscale homes and neighborhoods can look like price appreciation even if adjusted for footage. CS is showing 4% gains for denver. 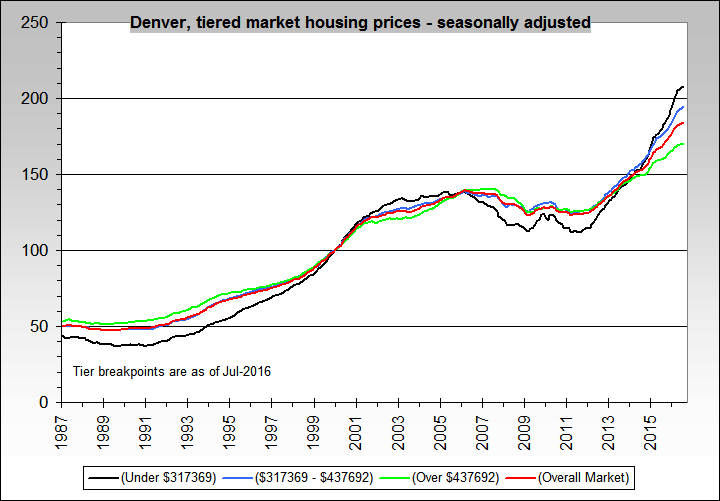 Morgan: Of course the 4% increase in Denver home prices according to CS is for April-June (average) and the 10% increase is for August. Others have pointed out, this is third time Barron's cover has called a bottom in the housing market. I do think they are getting warmer though. yes, i know, but these double digit increases have been being reported for several months now by the local guys, and the surveys that use better methodology have never shown anyhting like them. they are not even reading half. most of these local surveys just take a median home sold vs a year ago. they do not even really adjust for square footage, much less neighborhood or finishes etc. the surveys that do are showing some price increases, but nothing like these. i think surveys like CS are the far better gauge of actual prices. i think what we are seeing in these "median only" surveys is that houses for sale are no longer the smaller, worse located ones that were distressed sales and subprime hangover. i'm not saying this is a bad thing. it's necessary and health to work through it. but comparing like to like, prices are not up 10%. i'd be willing to wager that when we get the CS figures for denver in august, they will be closer to 4% than 10%. we need to be careful about exactly what these median price of homes sold figures are really showing. Whether we are talking the 4% or 10% or whatever, I think the important thing to note here is the year-over-year rise. Indeed... but in obligatory pess mode, in 2010 Case Shiller got all the way up to +5.4% YoY befire it hit new lows earlier this year. Well, that's part of my point, Bart. Let's first agree whether or not we've hit the bottom, then we can argue amplitude. Many of these sales are to cash buyers. It may be at an all-time high. It may be different than 2010. I know more than a few people with rental properties that are cashflowing great. It's much easier to rent, when many people don't want to own. Profit margins are higher and quality of tenants has improved. why do these monthly double digit sales gains for individual cities never show up in the national NAR totals? Let's first agree whether or not we've hit the bottom, then we can argue amplitude. Same here, and the results of all the home sales to those who rent them out likely means quite a different recovery picture, and on GDP too. Wow. What gospel truth coming straight from the the real estate industry. These numbers are comparable to comparing apples to horse dung. They are intended to make the buyer believe that there is an explosion in real estate prices beginning to happen. No question sales and traffic are up. But mortgages for the vast majority are difficult unless one has 20% down and a 720 FICO score. The Baltimore numbers are totally misleading from the headline perspective. As Paul Harvey would say "and now the rest of the story"
I remain a skeptic about a real recovery. What we have seen are the effects of massive liquidity injections into the economy and the typical bounce that comes in an election year. But the real problems are still with us. The employment participation rate is still very low. A record number of people have chosen disability over the past few years. A record number are on food stamps. Government debt is over 100% of GDP and growing. There is no end in sight to the deficits. The states and municipalities are going bankrupt. There is a class war plus some foreign wars raging. And a record number of homes sit with mortgages that are worth more than the market price. As usual, Mark is calling for a bottom. While he may be right one of these days I doubt that his optimism can be supported by the facts as they are. In the meantime, banks are sitting on a rather imposing pile of foreclosed, in-process-of-foreclosure, and seriously delinquent houses. They can't keep maintaining them forever. They're going to have to clear out the pipeline over the next 12-18 months. Watch prices fall when they start. Not until the election is over. But by that time you may have seen a devaluation that makes some homes attractive. If history is a guide real prices will fall by at least another 35% or so before bottoming. You are referring to the shadow inventory. During the double digit sale increases, many of the sales were short sales and foreclosures. The shadow inventory has dropped by a million from 4.25 mil to 3.25 mil homes from February 2010 to May 2012. Even in a normal market, there is always some homes in a state of foreclosure. In a normal market, there would be 2.9 mil homes in shadow inventory. They should hit that level by next year. At that point, the sale prices will stabilize even further. I missed the professor's article from Barron's. The shadow inventory dropped to 3.1 mil homes. The banks seem to be accelerating the pace of liquidations, which would explain all the cash sales this year. It may hit 2.9 mil by end of the year. this is purely anecdotal, but not all the houses sitting in inventory are going to be saleable. my folks were looking at a foreclosure in florida. the bank dithered and screwed around and would not approve the short sale etc. this went on for 9 months. in that time, the house was unoccupied and is now so mold and mildew infested that it is a tear down. i think similar things have happened in many markets. in places like detroit, whole neighborhoods are falling down. no question, there is some "shadow inventory' out there but such inventory costs money to maintain and degrades rapidly if such money is not spent. i'm not sure how to handicap the magnitude, but there may wind up being less inventory than one might predict and first glance. That may well be true. But unless the inventory has been written down someone will have to take an additional loss some time in the future. That would mean a loss of wealth and a weaker economic position on which to build a recovery. Destroying capital is not a good strategy if one wants things to improve.